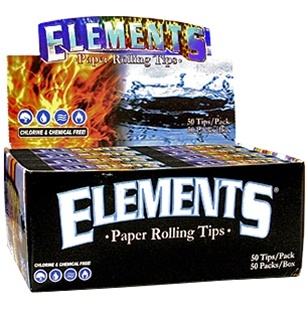 Elements rolling paper tips are packaged 50 tips per pack and 50 packs per display. Elements brand rolling paper tips are chemical and chlorine free. Burn your fingertips no more! Paper Tips for roll-your-own smokes. (Used as a replacement for the old rolled up matchbook cover trick). Putting the paper tip in before rolling is recommended and saves time and hassle. You're also more likely to get a perfect fit (this is how we do it using one of the hand rolling machines we sell). Basically, you roll the paper tip into a tight cylinder and either roll it in the papers along with your tobacco or you can roll the cigarette first, pull some tobacco out from one end and stick the tightly rolled paper tip into this end. The tip should expand a bit so that it makes a tight fit. Practice Makes Perfect! !